The higher taxes voters approved in 2016 to finance Sound Transit 3 may not be enough for some politicians and neighborhood groups who suggest route changes that could add as much as $2.1 billion, including tunnels in West Seattle and Ballard. The biggest request is an estimated $700 million to drill through the hillside to the Alaska Junction terminus station in West Seattle, instead of setting concrete guideway five stories high. Ballard advocates seek a tunnel for $350 million extra beneath the ship canal, or at least a 140-foot-tall fixed bridge, rather than a drawbridge that opens two to four times a day. Three powerful transit-board members — King County Executive Dow Constantine and Councilmember Joe McDermott, who are both lifelong West Seattle residents, and Seattle Mayor Jenny Durkan — have said they prefer neighborhood tunnels. So has City Councilmember Lisa Herbold of West Seattle. But Sound Transit CEO Peter Rogoff warns that “third party funding” would be required, on top of ST3 taxes and federal grants. Proponents haven’t identified yet where to find more money. “We’re going to need third party, fourth party, and fifth party funding,” Herbold said in a City Council transportation briefing in February. Anxiety runs highest in West Seattle, where neighbors hope an underground line can minimize house condemnations and preserve the Junction’s small-town feel. But the extra spending wouldn’t attract more transit riders, nor replace crowded buses with trains sooner. A tunnel would even delay West Seattle rail past the 2030 goal in the ST3 plan, transit managers say. A Ballard tunnel wouldn’t affect a 2035 schedule there, because that timeline is dictated by a technically difficult central tunnel through downtown. Sound Transit staff suggest that two routes be studied when the 18-member transit board votes in May to proceed with an environmental-impact statement. One option, drawn in brown on Sound Transit maps, would cost $7.9 billion and would build elevated tracks in Ballard and West Seattle. A blue route, with neighborhood tunnels and a downtown train stop between Union Station and King Street Station, would require $9.6 billion. Alignments can be mixed and matched, but the costliest options would surpass the original ST3 plan by $2.1 billion in today’s dollars. Did he mislead voters and taxpayers by promoting the ST3 measure as a “once in a generation opportunity,” when only two years later elected officials say they may need more money? Further engineering may find cost savings, like at Roosevelt Station, to open in 2021, where tunneling proved an affordable substitute for elevated tracks near I-5, he said. As light rail and more residents arrive, the three West Seattle stations plus an enlarged Sodo station are projected to serve 35,000 daily boardings, while the north-side line would see 52,000 boardings at five stations between Ballard and South Lake Union. Transit advocates who oppose a West Seattle tunnel say if the city can raise more money, it would be better spent on longer light-rail lines, more bus lanes, or walk-bike routes. “We’re highly skeptical of the value of spending $700 million or more on a West Seattle tunnel that has no advantages for riders,” wrote Seattle Subway, a volunteer group. Planners ought to find a less-intrusive elevated path, said executive director Keith Kyle. In 2016, the so-called “representative alignment” showed overhead rails through the corner of Southwest Alaska Street and California Avenue Southwest, known as The Junction since streetcars connected there a century ago. A 30-foot-wide track bed would shade the historic building that houses Easy Street Records. “To come out with a plan like that, it was a poor choice,” said Lora Radford, executive director of the West Seattle Junction Association, which represents 229 merchants. She hopes for an underground station two blocks east, where the lid would become a plaza for art shows and festivals, along with nearby apartments, a community center or a library. Constantine says he walked the corridor in mid-March, looking for options. “You can put elevated rail where it’s appropriate and doesn’t wipe out wide swaths of neighborhoods,” he said. 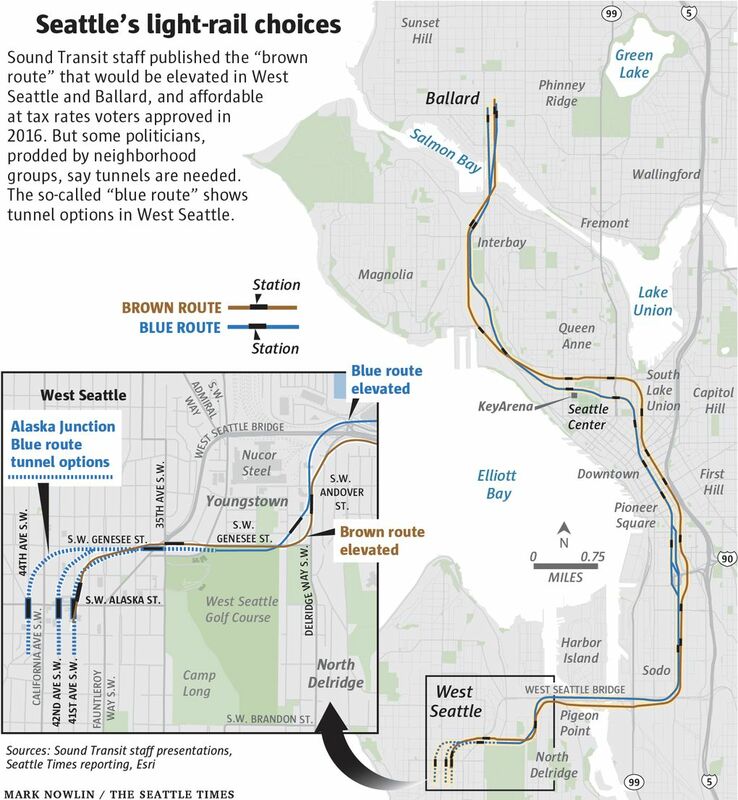 Neighbors were shocked in January when Sound Transit published the brown route, shifting elevated trains off five-lane Fauntleroy Way Southwest and into residential blocks just uphill, near West Seattle Bowl. Some 90 to 120 homes would be flattened to make room for tracks, a station, construction equipment and redevelopment. Fiona Booth and her partner, Charlie Able, bought their house next to Alaska Junction last spring, in part for easy access to the bus line and then light rail in 2030. The brown route shows concrete structures 50 feet high and 35 feet wide next to Douglas firs in her backyard. “It was very upsetting, but even more so than my personal feelings about my own house, I was horrified about what this line would do to this whole community and the entire West Seattle Junction neighborhood of Seattle,” she said. Why carve through those blocks? Sound Transit was reacting to public requests that the Alaska Junction station point south, so that someday tracks might extend to White Center, in a later ballot measure. That south turn requires a wide approach curve from the north, past Booth’s home. An East Alaska Junction Neighborhood Coalition formed in March to oppose that option. Homeowners have years to worry. Whatever route is picked, Sound Transit won’t begin to negotiate buyouts until between 2022 and 2025, said Cathal Ridge, central corridor director. Single-family homes might be replaced by the market anyway, as private buyers snap up lots for townhomes or apartments. The more housing built near stations, the higher the ridership and the greater the return on taxpayers’ investment. Even if a tunnel is built, elevated tracks would cross the lowland Youngstown neighborhood, next to Nucor Steel. 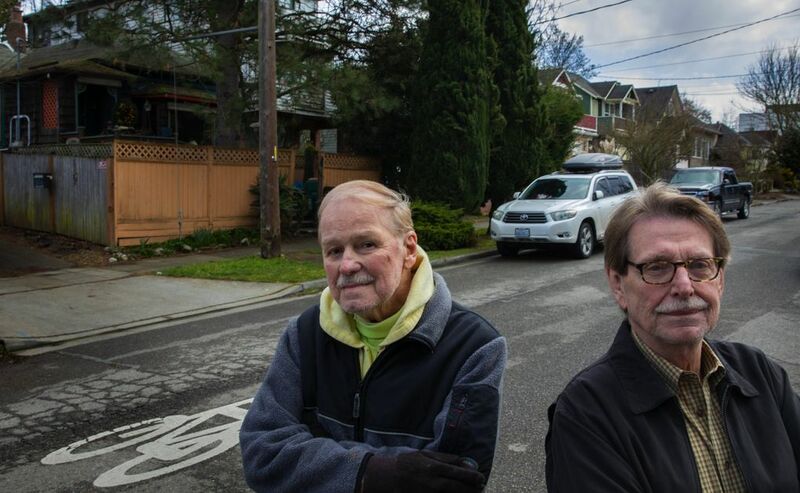 “I thought the idea in Seattle was to create housing, not tear it up,” said Larry Wood, who has lived in Youngstown with partner David Dow for 46 years. Their timber-framed house was built in 1903 as a fishermen’s cottage, and purchased by Dow in 1973. Over the years, they’ve welcomed unemployed workers to sleep there, filled the rooms with antiques, and built a front bay window. The blue route alignment would wipe them out. “We don’t want to live anywhere else. We have block parties. It’s been going on ever since we moved here. We actually have a neighborhood,” Wood said. Sound Transit policies encourage dense, transit-oriented development. Serving that end, the blue route’s diagonal station concept in Youngstown would knock down 40 homes, including space for construction equipment. 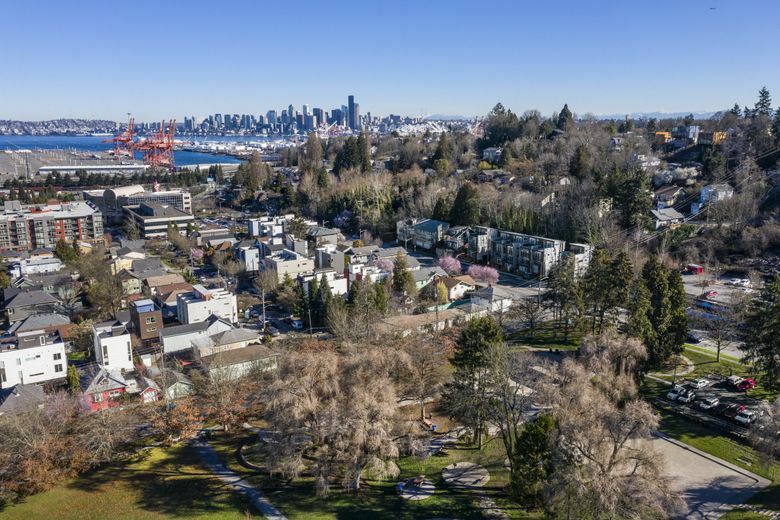 The cleared land would “facilitate development of possibly hundreds of affordable housing units near the station,” and a large grocery store that North Delridge lacks, the agency’s racial-equity memo says. A 2015 state law requires 80 percent of Sound Transit’s surplus land, after construction is complete, to go toward subsidized housing. But a Sound Transit development specialist said this station site is weak for bus connections, compared to an alternative next to Delridge Way bus stops, where 10,000 riders from a five-mile-long corridor that is still affordable and diverse could transfer to trains. In another $300 million option, an elected-leaders committee last fall suggested shifting the train bridge needed to cross the Duwamish River north of the West Seattle road bridges, to avoid a short dig and retaining wall at the tip of residential Pigeon Point. Port of Seattle Commissioner Stephanie Bowman opposes going north, because bridge construction could obstruct truck routes to Terminal 5 in West Seattle and Terminal 18 on Harbor Island. The port in February announced a deal to bring mega cargo ships to T-5. McDermott said it’s too early to say where to find more money for tunnels. Herbold said she believes leaders have until 2022 to figure it out, when the project advances to detailed engineering. I don’t think anybody’s talking very seriously about additional revenue sources at this time. “I don’t think anybody’s talking very seriously about additional revenue sources at this time,” Constantine said. A Seattle transportation tax ($60 car-tab fee, 0.1 percent sales tax to add bus service) expires after 2020, so the inevitable renewal vote could contain ST3 upgrades. Another tool is “tax increment financing,” where developers who benefit from rising land values pay for transit. State law authorizes a dormant car-tab tax charged in 2003-05 for an unbuilt Ballard-to-West Seattle monorail. If the city cancels a proposed First Avenue streetcar, Herbold said, some $110 million could be applied to ST3. The port might be solicited. There could be cost-sharing, like how Bellevue and Sound Transit split a $267 million increase for a shallow downtown tunnel, aided by city land and tax breaks from Bellevue. On Friday, both McDermott and Herbold urged Sound Transit to re-examine a so-called purple route that would protect neighborhoods by tunneling under Pigeon Point and Alaska Junction. That route was discarded last year because it would cost about $1.2 billion more than an elevated line. Meanwhile, long-term cash flow is tightening. In February, Sound Transit Deputy CEO Kimberly Farley reported a 15 to 20 percent construction cost increase since 2016. The market is still hot, she said. That heightens the anxiety by Snohomish County Executive Dave Somers about rising costs. As Sound Transit chairman in 2017-18, he warned that if Seattle routes require higher debt, the agency will have a tougher time selling bonds for his area’s projects to reach Paine Field and Everett by 2035. He called the brown route a good option that’s affordable with existing ST3 taxes. It can be trimmed by $400 million if the board picks a shorter tunnel curve from South Lake Union into Seattle Center, instead of reaching north to Mercer Street. Somers worries about stoking citizen expectations. “The more we study the Cadillac version of West Seattle to Ballard, the more attractive it’s going to look to everybody, the political momentum,” he said. If the 18-member board is asked to make cash-flow concessions for Seattle, he expects the majority outside the city limits to resist.